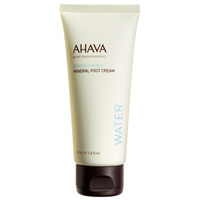 Ahava Advanced Hand Cream,has been praised by hands on people world wide. It soothes and protects without a trace of oiliness absorbing quickly to soften and protect.This extremely rich cream provides your hands with deep nourishment and hydration, instantly soothing chapped, dry surfaces and imparting healthy, satiny softness for increased comfort throughout the day. Absorbs quickly without leaving a greasy feeling and restores vitality for supple, softer and younger looking hands.